The closest finish in 67 years of 12-hour sportscar races at legendary Sebring (Fla.) International Raceway Saturday was all that separated the No. 10 Konica Minolta Cadillac DPi-V.R team featuring co-drivers Jordan Taylor, Renger van der Zande and Matthieu Vaxivière from a history-making trifecta of consecutive victories at North America’s three most iconic endurance marathons. After the team’s back-to-back victories in the 2018 season-ending Petit Le Mans at Road Atlanta and this year’s season-opening Rolex 24 At Daytona, the driving trio put nary a wheel off the 3.74-mile, 17-turn Sebring road circuit all day and well into the night, and Taylor crossed the finish line a mere 1.030 seconds behind the race-winning No. 31 Action Express Racing Cadillac DPi-V.R of Filipe Nasr, Eric Curran and Pipo Derani in the closest finish in the history of the Mobil 1 Twelve Hours of Sebring. It was the Konica Minolta Cadillac team’s second consecutive runner-up finish at Sebring and third consecutive top-two result at the Central Florida circuit, where it won the 2017 12-hour race at the hands of Taylor, his older brother Ricky Taylor, and Alex Lynn of Great Britain en route to that year’s driver and team championships. On the heels of its Rolex 24 win the final weekend in January with the all-star driver lineup of Taylor, van der Zande, Formula One veteran Fernando Alonso and former Formula One and current FIA World Endurance Championship regular Kamui Kobayashi, today’s runner-up finish was a tremendous achievement in itself considering an unscheduled pit stop during the opening laps to correct an overheating problem and subsequent pit-road speeding penalty dropped the No. 10 Konica Minolta Cadillac DPi-V.R to the back of the 38-car field. But persistence and successful strategy calls carried it to the front of the pack for the latter half of the race and put Taylor in position to steal the victory during a final restart with just seven minutes remaining after dogging Nasr and the No. 31 Cadillac DPi-V.R for the final two hours. Today’s race started under caution under heavy rains that began during the overnight hours and left the track saturated until the two-hour mark. The opening 11 laps were run behind the pace car before the race first went green on lap 12, by which time Taylor had already made three pit stops. The first was on lap two, when an air flow issue that caused the engine to overheat needed to be remedied. Since there was no more ground to lose at the back of the pack after the unscheduled stop, Taylor made two more trips down pit road to top off the fuel tank before the race finally went green. Taylor raced his way up to sixth place over the next hour and pitted for a scheduled fuel-and-tire stop when the Konica Minolta Cadillac was penalized for speeding – 1 kilometer per hour over the limit. He lost just one position while serving the drive-through penalty but fell off the lead lap. After biding his time over the next 40 minutes, Taylor made it back onto the lead lap during a caution period at the two-hour, 20-minute mark, benefitting from the wave-around. Some 15 minutes later, at the two-hour, 35-minute mark, Taylor handed the car over to Vaxivière, the 24-year-old French driver signed for the remaining three endurance events of 2019. Vaxivière stayed in touch with the leaders during his initial two-hour stint, running as high as third on several occasions before handing the car over to van der Zande at the four-hour, 34-minute mark. Van der Zande did his best keep the Konica Minolta Cadillac in touch with the leaders as the race’s halfway points neared. He was shuffled off the lead lap for a time, but was able to work his way up to second place by the time he handed the car back to Taylor at the six-hour mark. From that point forward, the Konica Minolta Cadillac and the Nos. 31 and 5 Action Express Racing Cadillacs would not relinquish the top three positions and took turns in the lead as they cycled through their three different fuel strategies. The three Cadillacs finally pitted on the same lap under caution just short of the 10-hour mark with Taylor back behind the wheel. He restarted third but promptly got by Brendan Hartley in the No. 5 Cadillac and stayed in the No. 2 spot the rest of the way. Taylor stayed within striking distance of the leader but just never close enough to attempt a clean pass. Nasr was able to open a gap on the final restart with seven minutes remaining and was able to keep Taylor at bay the rest of the way. Felipe Albuquerque crossed the finish line in third, 2.993 seconds behind Taylor. With today’s finish, the No. 10 Konica Minolta Cadillac DPi-V.R team is tied atop the standings with the No. 31 Action Express team, which was the Rolex 24 runner-up. 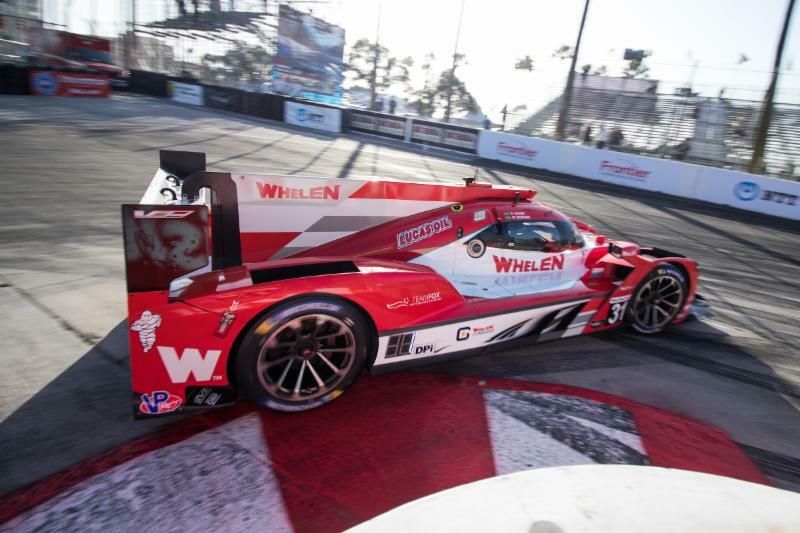 Round three of the 2019 IMSA WeatherTech SportsCar Championship is the Bubba Burger Sports Car Grand Prix on the streets of Long Beach, California, on Saturday, April 13. Live television coverage of the one-hour, 40-minute sprint race will be provided by NBCSN beginning at 5 p.m. EDT.